By now you’ve entered the Etsy Giveaway in honor of my St. Baldrick’s shave event on September 14th, yes? Of course you have. And you also know that I adore polish, especially indie polish, which I review for we heart this. Sooo, of course I have to show you some of my favorite indie polishes in green, like the lovely St. Baldrick’s logo. 1. Aliens Exist!!!! At least in nail polish by Black Sheep Lacquer. 2. Nail Pattern Boldness is a superstar in the indie polish world and you can see why with Flipping Out Hard. Made up of yellow, green and blue matte neon glitters, this bad boy is neon awesomeness. 5. Digital Nails is a favorite of mine, AND a Texas gal! deGrasse’s greener. Get it??? HA! Pretty pretty glitter AND hilarious puns about the science-guy badass. 6. Get Clover It by KB Shimmer is so shiny and squishy, I love it. 7. & 8. Want your polish to do more than be pretty? Try Neon Green Nail Polish by Beyond the Nail which is UV reactive! Need more? How about Green to Lime Thermal Color Change, which changes with temperature? Need MORE? I’m sorry. You can’t have more than that. You’re just going to have to calm down. 9. Another by Digital Nails; if you are a fan of Adventure Time, you have already gone to Etsy and put Old and Bonkers in your cart. 10. Sour Apple by Model City is a gorgeous light green holo. Let me repeat that, LIGHT GREEN HOLO. How often do you see a baby green polish with a subtle holo? Never. That’s how often. You need this. 11. Sour Grapes don’t have to be ugly. Try a duochrome green to purple color shift nail polish by Spectrum Cosmetics. 12. Juxtapose by Mod Lacquer. I actually own this and it applies like buttah. You need it. NEED. IT. 13. Kiwi Smoothie by The Hungry Asian. So cool and creamy!! 14. Finally we have Green Gables by Literary Lacquers. It stands alone because it is special…and because I am not so good with planning out my collages. (I AM LEARNING, YOU HUSH.) Regardless, this beauty is a green holo and is inspired by Anne of Green Gables. (I KNOW! I got all excited too!) I adore this brand because all of her polishes are inspired by literary works, and they fit their inspirations perfectly. Polish AND books?? She is a woman after my own heart. **All photos are property of the site owner. All items were chosen because of heir awesomeness and I am receiving absolutely no compensation for the mention. I am a sucker for duochrome or holo polishes. It’s a fact. I have the Green Gables polish (okay, I have the whole Green Gables set, actually, because I am weak) and it is SO LOVELY. Are you familiar with The Lady Varnishes? Most of her polishes are inspired by books, movies, and tv! Yes!! I’m a fan of hers too, her Brooding Boys collection fills me with WANT. I love KBShimmer!! 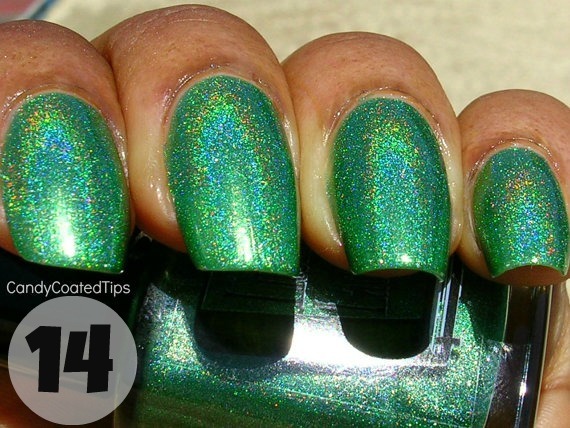 Love your picks here – I love green polish personally. I do too! Greens are just so eye-catching and interesting, I love it.